Guest speakers included politicians Bernie Sanders, Arnold Schwarzenegger and Sadiq Khan; journalists Christiane Amanpour and Ta-Nehisi Coates; filmmakers Barry Jenkins, Darren Aronofsky and Steven Spielberg; and others including Elon Musk and David Banner. Actor and comedian Bill Murray appeared at several unofficial functions during SXSW. Films entered at SXSW Film included Us, The Beach Bum, Long Shot, Booksmart and The Highwaymen. TV series that previewed included FX’s What We Do in the Shadows, Hulu’s Shrill and OWN’s David Makes Man. 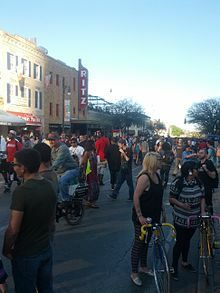 Some of the first forums of the 2020 presidential race took place at SXSW, with Democratic presidential candidates Pete Buttigieg, Julian Castro, John Delaney, Tulsi Gabbard, John Hickenlooper, Jay Inslee, Amy Klobuchar, Beto O'Rourke, Elizabeth Warren and Andrew Yang all making appearances at the festival (though some had not yet announced their candidacy at the time). Other scheduled guest speakers included politicians Mazie Hirono and Alexandria Ocasio-Cortez; musicians David Byrne and Wyclef Jean; actors and comedians Aidy Bryant, Kathy Griffin, Ethan Hawke, Trevor Noah and Zoe Saldana; businessmen Tim Ferriss, Jeffrey Katzenberg and Guy Kawasaki; and others including Priscilla Chan, Neil Gaiman, Valerie Jarrett, Bill Nye, Robert Rodriguez and Maria Shriver. ^ American-Statesman Staff. "THE SUSPECT: Family of Mark A. Conditt 'grieving' and 'in shock'". Austin American-Statesman. Archived from the original on 2018-03-22. Retrieved 2018-03-22.